Today was my first day of Camp 78. Camp 78 is a trip camp and today we went to Hot Skates, a roller skating place. I had a good time there and look forward to future days at the camp. One of the things that surprised me was that the counselors are very loose with their rules. In the contract I had to sign, there was a strict mobile phone policy with extreme consequences, but at camp almost everyone was on their phone all day, and the counselors didn't care. Also I didn't get assigned to a group or section, I just got on the bus and signed in. I think it's interesting that as we get older there are less regulations on us because we mostly learn to do the right thing. 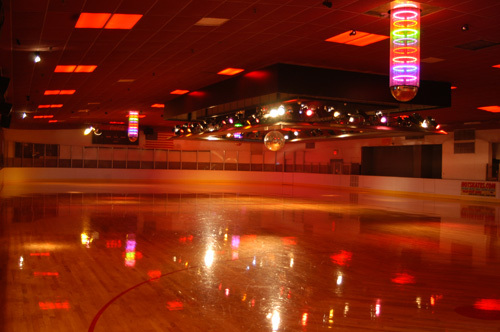 The Hot Skates rink was really fun, even though I've never roller skated before. By the end of camp, I felt proficient enough to roller skate to school. One of the things that contributed to the experience was that 15 minutes after getting onto the ice they dimmed the lights and turned on a disco ball and put on good dance music. I was, however, a little annoyed at how some of the employees at the place kept disobeying their rules and getting in the way of crowds, and often knocking into people. I am very happy I get to go to a camp like this. I enjoyed the excitement and novelty I had today. I am looking forward to tomorrow.